This post contains affiliate links. This means that if you click through and decide to make a purchase, the price you pay stays the same but I might receive a small commission that goes back into keeping the blog running. Thanks for your support. OK, I admit. It's not rocket science. But after nearly two years on the autoimmune protocol (with reintroductions) you start to think of more creative things to do with your meat patties. And so one day I started using them like bread, in a sandwich. I'd seen Ditch The Wheat's Meat Bagels all over Pinterest, and I just thought - yeah, why not just use meat patties like bread in a sandwich? Makes packed lunches really easy to eat, and taking food with me when we go out for the day now is a doddle! As easy as packing a sandwich, in the old days. You can use whatever type of meat patty you want to - I've used turkey here - but there's beef, chicken, lamb... just choose the patties to go with whatever else you're filling it with. I preferred turkey because it's leaner and lighter - and less greasy to hold. It's probably a safer bet to stick to veggies as your filling. I've added a slither of ham here, with some lettuce - because the pale turkey was kind of calling out for some saltiness - but I'd probably stick to avocado, lettuce, cucumber and gherkins in the future. Bacon would be fantastic. I've used the patties whole here. I stood griddling a big batch of them so I had enough for snacks and husband's packed lunches for the week. I cooled them down quickly and then refrigerated them. For this, I needed to keep the patties very thin. If making thicker patties just cook them for a bit longer and then, once they're cool, slice them in half horizontally, as you would a bread roll. Autoimmune and paleo packed lunches: Transformed. 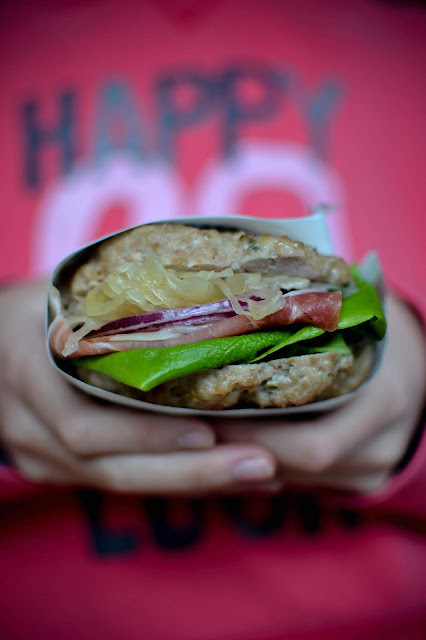 Inside Out AIP Paleo Turkey Sandwiches from my ebook Let's Do Lunch! Fillings of your choice: lettuce, gherkins, bacon, (AIP-compliant ham), rocket/arugula, herbs, spinach, etc. First, melt the coconut oil in a large frying pan or griddle and fry the onions, over a gentle heat, until softened and beginning to turn translucent. Scrape into a waiting (large) bowl and leave to cool completely. Once the onion is cooled, mix in the turkey, oregano and garlic salt and mix to combine. Don't over-mix or the meat will likely turn chewy once cooked. Melt a little more oil in the pan you fried the onions in and, as it's heating up, grab a small handful of the turkey mixture and form into a thin patty. Flatten it out, and gently lower it into the frying pan. Cook them in batches of 4, so they're not overcrowded. They'll take about 4-5 minutes per side to cook - check they're cooked completely throughout and then place onto a waiting plate. Leave to cool completely and then cover, and refrigerate until needed. 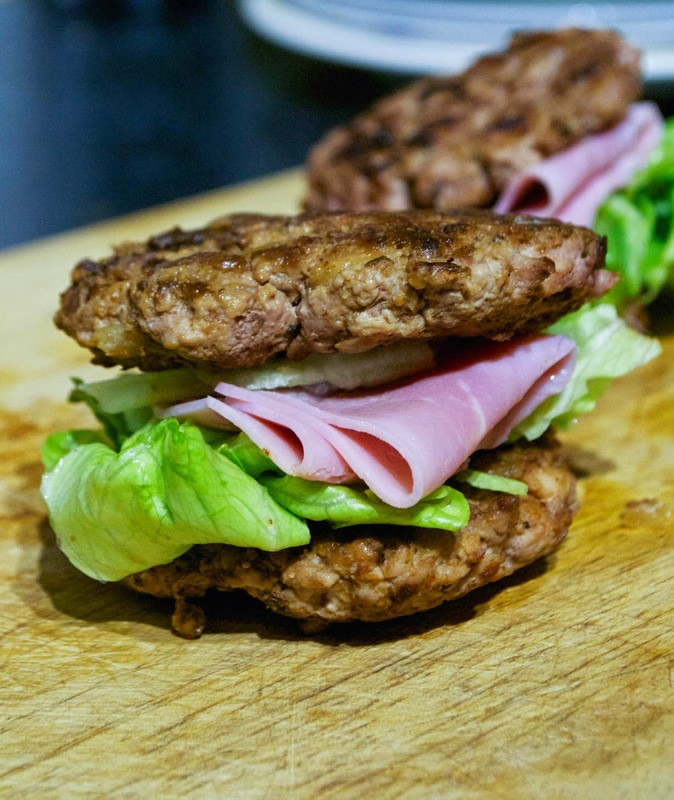 To make the sandwiches, treat the meat patties like slices of bread and load your fillings inbetween. I've entered this recipe into Phoenix Helix's Recipe Roundtable - check it out for lots more AIP meal inspiration!